Taking Senior Citizen Centers by storm, Indoor Chair Volleyball is an activity that includes Physical Activity, Social Interaction, competition and most of all, lots of laughs! As my Mother-in-Law says, "you can only play so much Bingo!" From the Fit to the wheelchair-bound, young and old alike, this activity is useful in Physical and Recreational Rehabilitation facilities, RV Parks, Rec Centers and home use, too! While usually played from standard folding chairs with a 20" beach ball, my 90-year-old mother played one-handed in a wheelchair with a badminton racquet just 3 weeks after suffering a stroke! (see below). She really enjoyed the competition and comradery! We stock these Hard-to-Find Chair Volleyball Nets!! 10-ft wide with stable metal frame. Adjusts from 34-60 inches high. Easy to assemble and folds easily for storage. No tools required. Convenient carry bag included. Rubber-tipped legs protect the floor. Loads of fun!! 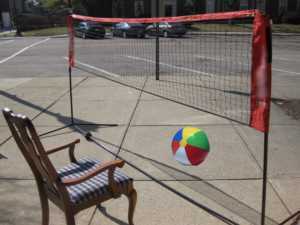 Chair Volleyball Net: only! $139.99 20" inflatable balls: $4 ea. Start having MORE FUN today!!!!!!! WE NOW CARRY PICKLE BALL EQUIPMENT, TOO! !